Need help. I tried ordering them from my local shop but the first time they ordered the wrong pads and now if I have not heard from them for two weeks. I tried; I give up. So, I need to order online but am not sure about sizing. I am 6 feet tall and skinny (163lbs). I get the sense I fall in between the medium and large. Can anybody provide some insight? i'm 6' 165-170. You want a Large. Mediums will be too short. The larges will be too wide and loose. I'd sacrifice a little bit of coverage and go for the smaller ones. too wide and large ....what? i'm on my 2nd set of them (thats how many crashes i've put through the first set) and there was never a problem with them being "loose". i'm the same height/build as the OP.. i tried on mediums and it ends up leaving ~2-3" of my lower shin exposed. they arent loose by any means... you know the straps are adjustable yes? i wouldn't sacrifice any coverage, i'd get the right size and protect your entire knee/shin. Thank you. Large it is. Do these run more streamline/smaller than the strait's? I'm 5'11" 165lbs and I use the mediums. They fit perfect. I ride the 5.10 mid cut shoes, and the larges were a little too long and dug into my shoes. They don't last near as long as the Race Face armor. 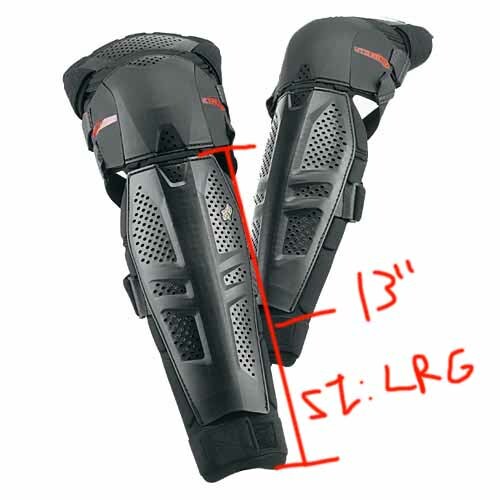 The bit that connects the knee with the shin guard is a little flimsy and I had one rip apart in a crash a couple months ago. If you use your pads regularly (i.e. crash a bit) the Fox Launch won't last. 6'1, 165, and own two pairs of larges. No issues. could you please help me with deciding whether to go for the S/M or L/XL on the Launch Knee/Shin? I have very thick calves (44cm/17inches) and therefore I'm thinking L/XL, but the length seems too much for me. 56cm/22inches ends 10cm/4inches above my knee. Could you please let me know the length from the bottom of the guard up to the bottom of the knee on the guard for both sizes? ^ the medium will fit your calves albeit a little tight but you can loosen the straps up to compensate for this. The large ones will be too long and they'll end up restricting your pedal motion because they will get pushed by your shoes. It's better to go with medium. from right where the knee hinges to the very bottom beneath the velcro its 13" for size large.